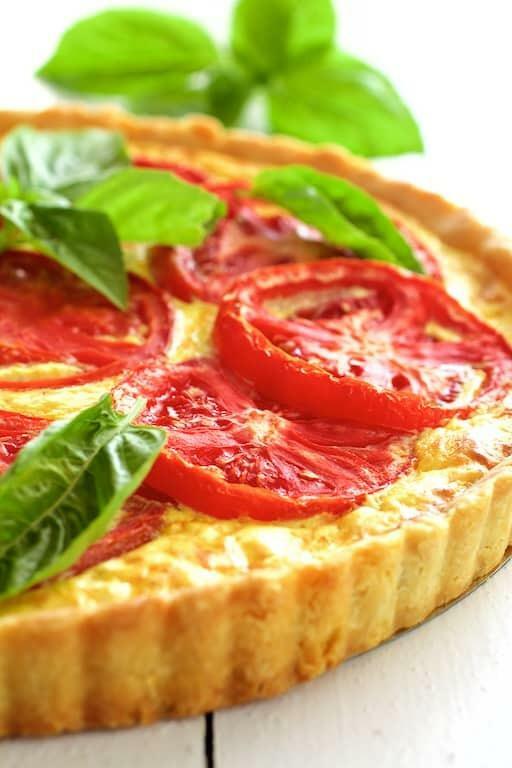 This savory Tomato Ricotta Tart with Basil Pesto is a delicious way to enjoy more of those tantalizing summer tomatoes before they're gone! Preheat oven to 400 degrees. Combine flour, butter, sugar and salt in a food processor. Pulse to combine until mixture resembles coarse meal. Add 1 tablespoon ice water to flour mixture, pulsing after each addition. You'll need at least 3 tablespoons. Test the mixture to see if it comes together in your hand. If not, add 1 more tablespoon. Empty crust mixture into an 11-inch tart pan with removable bottom. Gently pull the dough together to form a ball, then press it back out into the tart pan and up the sides to create the crust. Dock the crust with a fork. Place in the freezer for 20 minutes. Place on a baking sheet then place a piece of parchment paper over the crust, fill with pie weights, old dried beans, lentils or rice. Bake for 15-18 minutes or until light gold in color. Let cool. Reduce oven temperature to 375 degrees. While crust is chilling and then baking, drain the tomatoes. Salt both sides then place on paper towels or a clean kitchen towel. After 20 minutes, flip the tomatoes onto a dry area of the towel(s) and drain again. Pat dry. Spread some of the pesto over the crust. Whisk together ricotta, Parmesan cheese, eggs, garlic and salt and black pepper. Pour into prepared crust. Arrange the tomatoes over the top in a pinwheel fashion (or get creative!). Bake for 45-50 minutes or until ricotta custard is set and tomatoes appear "dry." Serve warm or at room temperature with additional pesto. While tart is baking, combine pesto ingredients in a food processor or blender. Serve with tart.